Understandably, filmmakers dealing with a subject matter that concerns darker moments in history have tremendous expectations placed on them. Essentially, they don’t get a pass for being merely adequate. 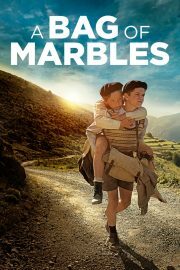 So whilst A Bag of Marbles (Un sac de billes) isn’t terrible, it frustratingly lingers somewhere between having a few well-executed moments and being largely unremarkable. Directed by Christian Duguay, the feature is based on the memoirs of Joseph Joffo, a Holocaust survivor who as a child traversed occupied France to escape the Nazis and antisemitism, and to reunite with his family. The story follows pre-teen Joseph (Dorian Le Clech) and his brother Maurice (Batyste Fleurial) as they journey to safety. Regarding the finer moments of this French-language film, there are some scenes in which the horrifying nature of antisemitism is given justice. The young protagonist’s first observance of Nazi harassment of Jews at a train station is both moving and absolutely terrifying, given the perfect level of solemn reverence. The detestable nature of violent anti-semitism is portrayed well by the Canadian auteur, and so too is the hopelessness and vulnerability perceived by Joseph and his family. Watching the boy’s parents (Patrick Bruel and Elsa Zylberstein) being forced to make difficult decisions to ensure their children’s survival is moving and intensely captivating. Aside from these sequences, despite a rich historical and biographical background to draw context from, the movie can be relatively stagnant. The first 40 minutes of the film seem designed to get from point A to B as quickly as possible, without building up the atmosphere or exploring character development. Unfortunately, this neutralises the emotional impact of otherwise pivotal or relevant scenes. For instance, an early reunion between the brothers and their family members – after a perilous journey avoiding hawkish Nazi guards – is treated with very little of the gravity that would be expected from members of such a close-knit unit. The lack of oomph, as well as the tonal dissonance, results in a good portion of the picture feeling mechanical. The piece doesn’t do adequate justice to the subject matter, nor does it fully represent Joffo’s extraordinary experience. With that said, A Bag of Marbles isn’t abysmal. It has several engaging episodes, and Bruel and Le Clech put in solid performances. If nothing else, it should be applauded for attempting to tell this exceptional story. However, despite the moving and powerful subject matter, this promising piece of cinema has ended up just being passable. A Bag of Marbles (Un sac de billes) is released nationwide on 23rd March 2018.